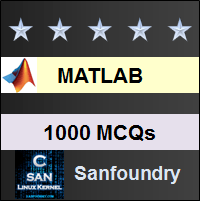 This set of MATLAB Multiple Choice Questions & Answers (MCQs) focuses on “Logical Expressions – 1”. 1. If a logical expression is true, it will always return a logical 1 and if it’s false, it’ll always return a 0. Explanation: Any logical operation is pre-defined in MATLAB to give a logical 1 if the result derived from the operation is true. If the result is false, the result returned will be a logical 0. 2. The functioning of all() and any() is same. Explanation: The all() function returns a 1 iff all the elements in the input vector is non-zero. The any() function returns a 1 iff at least 1 element in the input vector is non-zero. Hence, they are different in functioning. 3. What does the function all() do? Explanation: The all() function is inbuilt in MATLAB. If we give a vector input to our function, it will return a 1 if all the elements of the vector are non-zero. 4. What will be the output of the following code? Explanation: The all() function returns a logical 1 iff all the elements within the input vector are non-zero. Since, here, one element is 0- the logical output is 0. 5. Choose the correct hierarchy of operations. Explanation: Amongst the given operators, the hierarchy is [.^], [+], [-], [:], [&], [|]. Hence, the only possible option is +,-,&,|. The rest are erroneous according to the pre-defined hierarchy in MATLAB. Explanation: Since + is a unary operator, it won’t give an error in MATLAB. Hence, the output of the above code will be 11. Explanation: Nan cannot be used while dealing with logical operators. Hence, the above code will give an error. 8. What will be the output of the following code? Explanation: Nan is not defined in MATLAB. It should have been ‘NaN’ or ‘nan’. If it was either of them, the result would’ve been 1 since NaN is not equal to 0. 9. What will be the output of the following code? Explanation: The output of xor(3476,1234) will be 0 since xor() returns a logical 1 iff one of the argument is 0. Since we have added the not operator before, the output will be 1. Explanation: The output of ~or(0,1) is 0. The output of ~xor(1,1) is 1. Hence, the output of ~or(1,0) is 0. Explanation: The any() function returns 1 if any element, within the input vector, is non-zero. Since NaN is non-zero, the output will b 1. 12. What will be the output of the following code? Explanation: The all() function takes a single vector as input. If we had placed all the elements within , there wouldn’t have been any error and the output would’ve been 1. NaN won’t give any error infact the occurrence of NaN will give the output 1 or the output would’ve been 0. Explanation: The all() function returns 1 iff all the elements within the input vector is non-zero. Here, xor(1,0) is 1 and ~xor(1,1) is 1. or(1,1) is 1 and cos(pi) is -1. Thus, all the elements are non-zero. Explanation: sin(pi) is not 0 since pi is just a floating point variable in MATLAB. The output of sin(sym(pi)) would’ve been 0. Thus the output of the above code is 1 since the function all() returns 1 iff all the elements of the input vector is non-zero. Explanation: Amongst the given operators, the correct hierarchy is <, <=, >, >=, &, |. Thus the most plausible >,>=,&,| according to the pre-defined hierarchy of operations in MATLAB.